The name “Morocco” comes from the Spanish word, Marruecos. The full Arabic name, Al-mamlakah-al-magribyyah, means, “Kingdom of the West.” Up until the 20th century, many different countries called Morocco by different names. For example, the Turks called it Fas, a name that stems from its ancient capital city of Fes. Egyptians and Middle Eastern countries called it Marrakes, and some still do. Marrakesh, the capital city during the Almoravid Dynasty, is the basis for the English name which likely came from the Berbers’, Amur Akush or “Land of God,” however, the origin is still disputed. Morocco is the only African country with a coast on both the Mediterranean Sea and the Atlantic Ocean. It is located in the Maghreb region of North Africa. It contains numerous types of topography; there are rugged mountain ranges in the interior and large tracts of desert land, contrasted by miles of beautiful coastline. Its African neighbors are Algeria and Western Sahara. Spain, to the north, is just a short ferry ride across the Strait of Gibraltar, making Morocco an easy tourist destination from Europe. Morocco has a rich history and one of independence, not shared by its neighbors. The first Moroccan state was founded in 789 AD and has been ruled by a number of independent dynasties. Morocco was the only North African country to avoid Ottoman occupation. Back in 1912 Morocco was divided into French and Spanish protectorates, with an international zone in the port city of Tangier. Morocco regained independence in 1956, although there are still areas of dispute between Western Sahara and its Southern Provinces, as well as a few Spanish islands. Today Morocco is the only African state that is not a member of the African Union. It withdrew after the Union accepted Western Sahara as a state, a conflict that today remains unresolved. Morocco is run as a constitutional monarchy with an elected parliament. The current ruling dynasty, the Alouite Dynasty, seized power back in 1666. The king holds vast executive and legislative powers. 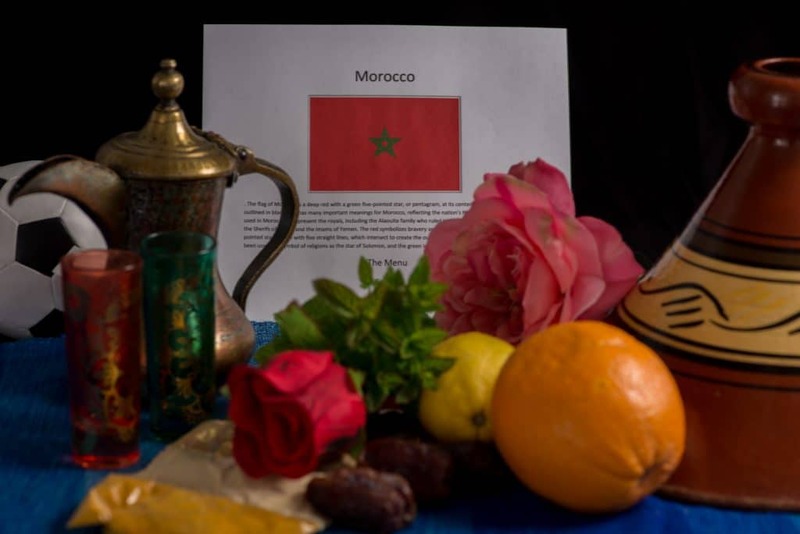 Way back in the middle of the seventh century, during the Muslim conquest of the Maghreb, both Islam and the Arabic language were brought to Morocco. The indigenous Berbers adopted Islam. Today Arabs and Berbers make up the largest percentage of the population and 99 percent of the country is Sunni Muslim. The official languages are Arabic and Tamazight (a Berber language.) French is also widely spoken and taught in school. The current King Mohammed VI is known to be a cautious modernizer who has introduced ideas of economic and social liberalization. In 2004 women’s rights achieved a major step forward with the reform of the country’s personal status code, the Moudawana. A few things that were manifested were: Women can now retain custody of their children, the unilateral repudiation of a wife is abolished, a man’s taking of a second wife is subject to approval from the first wife, and the minimum, legal age of marriage was raised to 18. Rabat is the capital city in Morocco and was chosen as such by the French back in 1913. The largest city is Casablanca, made famous in 1942 by the Academy award winning film starring Humphrey Bogart and Ingrid Bergman. Although the film was not actually made in Morocco (it was filmed in Los Angeles) it is considered to be one of the best films of all time. Today you can find recreated places from the movie, such as Rick’s café, which brings in many tourists. Casablanca is the economic center of Morocco but is not known for the charm of many of its other well-known cities. It is the port city for the Royal Moroccan Navy. It is home to the world’s seventh largest mosque. Completed in 1993, this mosque has the world’s tallest minaret, at 689 feet high and has the largest covered area, providing space for 80,000 worshippers. The Hassan II Mosque is Casablanca’s most significant landmark. Marrakesh is known as the red city, due to the red walls and sandstone buildings that were built back in the 12th century. There is a vast market square in Marrakesh called, Jemaa el Fna, which translated means, “Assembly of the Dead.” It likely got its name because up until the 19th century, it was a place where the heads of criminals were publically displayed. Today the square is bustling with vendors, snake charmers and all sorts of amazing Moroccan food. The beautiful and magical, little city of Chefchaouen is found nestled in the Rif Mountains. It is known as the Blue City. You can read about my recent visit there in last week’s journey. Tangier is the oldest city in Morocco. It was inhabited by the Phoenicians back in 1600 BC. Between 1922 and 1956 it was an international city, having representatives from eight European countries. Fez is another popular city in Morocco and is considered the most complete, medieval city in the Arab world. Morocco was the first country to recognize the United States as a nation, back in 1777. The Sultan Mohammed III, protected American ships, allowing them safe passage in the Atlantic. Morocco also has the longest standing friendship agreement with the United States, dating back to 1786, when the Moroccan-American Friendship Treaty was signed. The Tangiers American Legation building was a gift to the USA back in 1821 and was used as a consulate until 1961. It is the first building outside the USA to be registered as a National Historic Landmark. Morocco was second behind Egypt in the Arab world to improve relations with Israel. In 1993 the king opened up direct air travel, telephone and mail services. The economy of Morocco is diverse and they are working on tourism becoming its number one revenue source. As of now, tourism is second after phosphate production. Morocco is also the largest processor and exporter of sardines in the world. Morocco does have some controversial exports, as it is also known as one of the world’s largest producers of hashish. Also a major source of income in the Rif mountainous region, comes from cannabis. It is believed the term “reefer” stems from the Rif region. As we look into the cuisine of this exotic and beautiful country, we find they have a lot to offer. 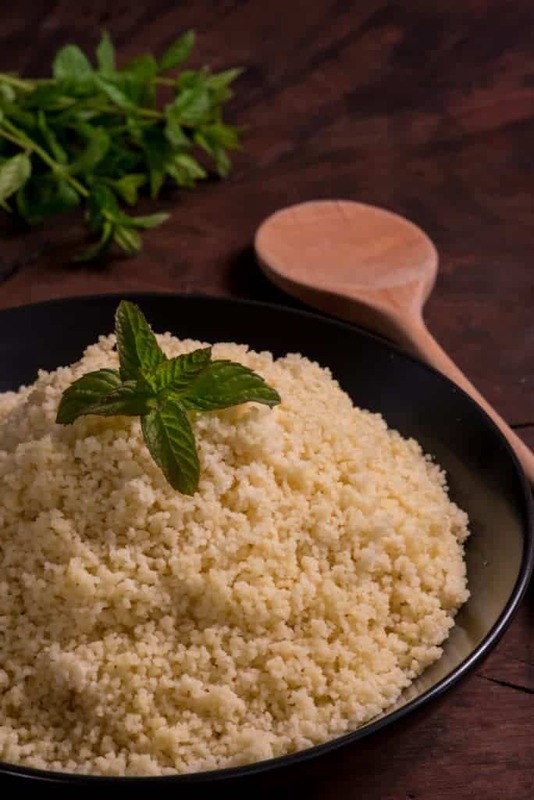 Seksou or (couscous) is considered to be the national dish of Morocco. It is an ancient dish of the Berbers, comprising granules of semolina that are steamed, typically over a pot filled with vegetables and often meats. The steaming vessel is known as a couscousier. The Berbers used local ingredients like, olives, figs, and dates to prepare lamb and chicken stews. The strongest influence came from the Arabs around the seventh century. They introduced many spices such as: saffron, cumin, cinnamon, ginger and caraway. They also introduced a sweet-sour style of flavors, learned from the Persians. Morocco’s proximity to Spain led to Moorish and Andalusian inspiration as well. French and British facets can also be found there. Morocco produces all the food it needs to feed its people. They are blessed with many home grown fruits and vegetables. Some native foods that are very important in Moroccan cooking are lemons, (preserved lemons are a real treat), olives, figs, dates and almonds. Located on both the Atlantic and Mediterranean coasts, seafood is abundant. Lamb, beef and chicken are all popular meats but it is the distinctive flavoring that comes from their blends of spices that make these dishes unique. 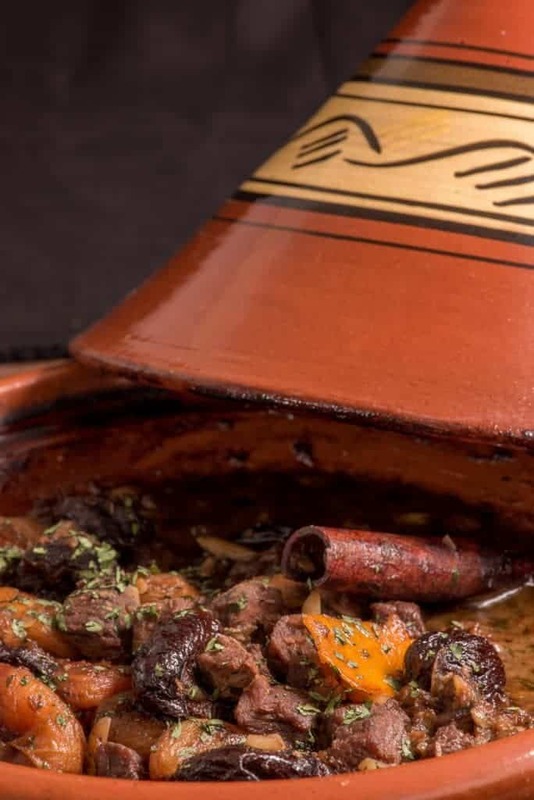 One of the most recognized dishes in Moroccan cuisine is the tagine or tajine. Its name comes from the conical shaped earthenware that is designed to let steam escape while cooking, making a tender and delicious meal. Desserts made from almonds and honey are found in every household and enjoyed with the famous mint tea, which is served with every meal. So let’s enjoy a Moroccan meal. To set the mood we placed the blanket that I purchased in Chefchaouen on the floor and arranged cushions around it. We put on Gnawa music, which is a fusion of Arab, Berber and African rhythms. We began with a hand washing ritual. It is customary to only eat with your right hand as the left is considered unclean. Spoons are often used for couscous and soups. It is important to note that if you are ever offered meat to eat, you should accept. It is considered extremely rude to refuse meat. Adding to the décor, we placed several large roses around, as they have a very important area in Morocco called Vallee des Roses. In 1912, French perfumers determined the valley would be an ideal place to grow and cultivate roses. Today the area is full of bushy roses and two large factories in the valley distill rose essence. With a few candles lit, we began with a toast of wine. Although Morocco is a Muslim country, they do export wine through a French company. It was Romans who began making wine in Morocco some 2000 years ago. The Gris de Boulaouane is a rose’ with an orange tint and is one of the best selling Moroccan wines. 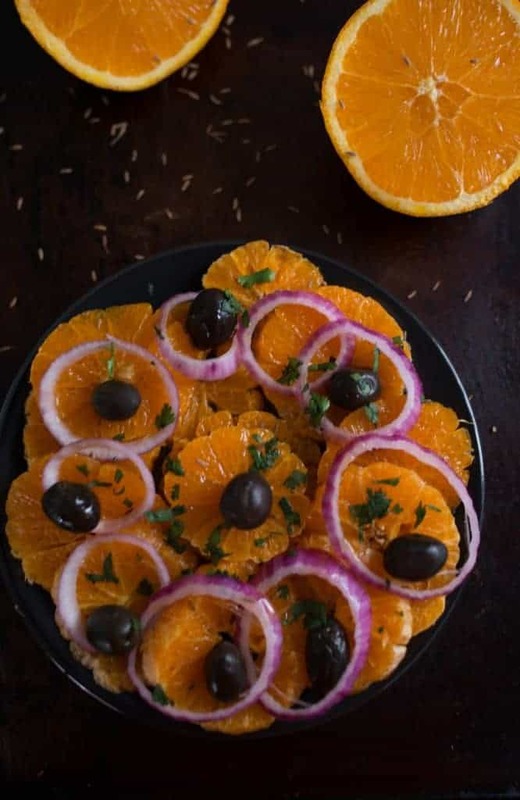 Our first course was a delicious orange, onion and olive salad. This light and refreshing salad was outstanding. The dressing was excellent, made with olive oil, lime and seasoned with cumin and paprika. Often times a citrus salad is served alongside grilled meats and spicy dishes. 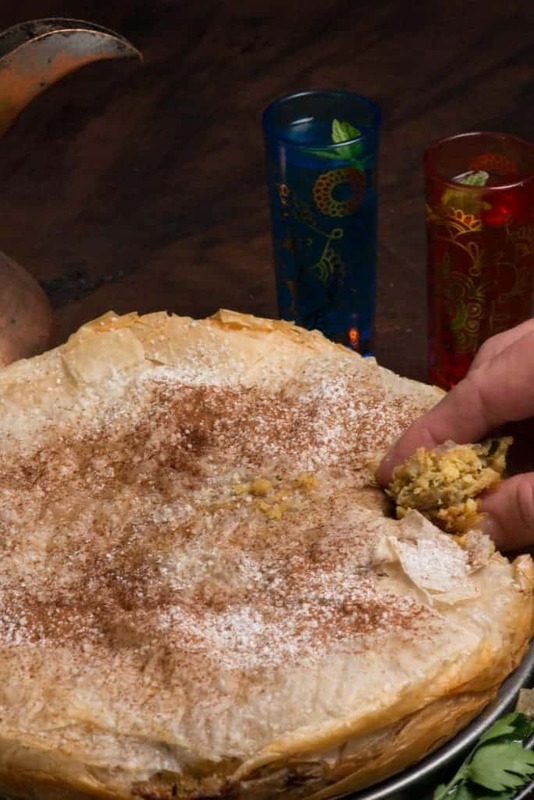 The second course was a traditional dish called pastilla, sometimes spelled b’stilla or bastilla. This was originally made with pigeon but now is usually made with chicken or is served as a vegetarian dish. It is somewhat like a pie, however the crust is super light, made from delicate pastry sheets. The chicken is flavored with an assortment of spices and mixed with eggs and nuts. The top is sprinkled with cinnamon and sugar and the result is a sweet and savory delight. For the main course we enjoyed a lamb tagine, made with apricots, prunes and almonds. It was the honey that rendered an amazing sweet sauce that was perfectly soaked up by the hand rolled couscous. Couscous is always served on Fridays and they call Friday “Couscous Day” in Morocco. It is considered a holy day much like Sunday is observed in the US. I decided to make the couscous from scratch. It was totally worth it. I would equate the effort similar to that of making homemade pasta. It really was not too difficult and if you have the time, it is all the more satisfying. 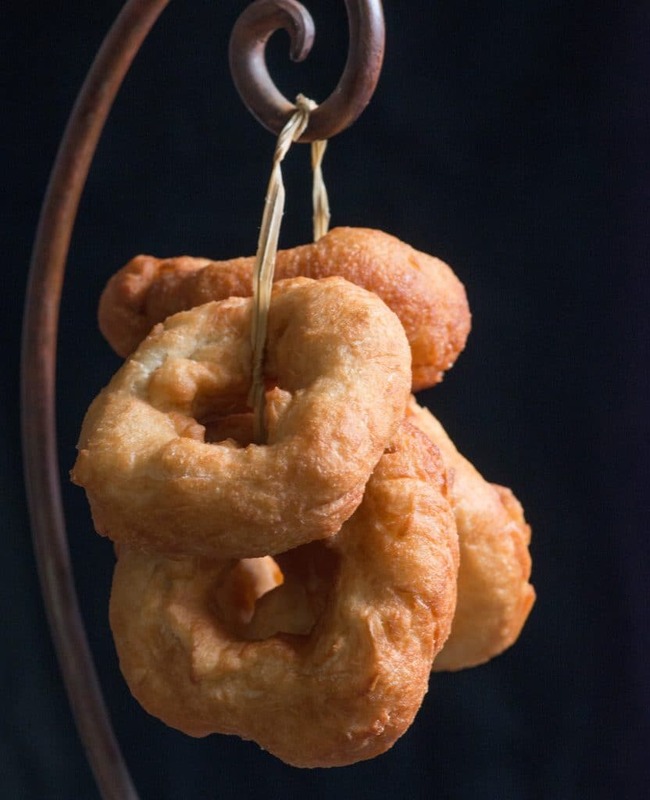 For dessert we enjoyed sfenj; those amazing doughnuts we discovered on the streets of Chefchaouen. Of course mint tea was the perfect accompaniment. Mint tea it is the national drink in Morocco. It was introduced to Morocco in 1854 when blockaded British merchants unloaded large quantities of tea at Moroccan ports. Made from Chinese green tea, it is brewed with mint leaves and lots of sugar. It is also called Moroccan or Berber whiskey. The tea or atai as it called, is served with much pride and ritual. As we say goodbye to this unique and hospitable country, I leave you with a one word; “Shuukran.” This simply means, “Thank you” in Arabic and when said with a couple of pats over your heart, gives it a sign of sincerity.